Spring ski touring and heli snowshoeing just around the corner! 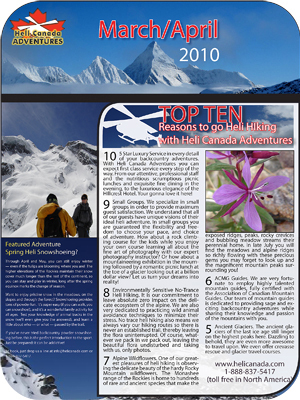 The top ten reasons to come Heli Hiking with Heli Canada Adventures are now in the newsletter for you to ponder and enjoy. Also good spring Ski Touring and Heli Snowshoeing is just around the corner! We look forward to hearing from you.